Kyle Crane is inserted into the city of Harran on an assignment from the Global Relief Effort or the GRE for short. He’s on a mission to recover a stolen file from a man named Suleiman. On arrival he’s bitten by the infected residents in the area and rescued by friendly survivors from the Tower. Crane discovers quickly that the GRE wish for him to obtain the files by any means. He’s torn between doing his duty and helping the citizens in Harran survive. Lovely – Harran may be ripe with the stink of The Walking Dead, but you couldn’t tell by how beautiful it looks. Beyond desolate ruins of a city ravaged by corpses – lies a gorgeous island surrounded by clear water. 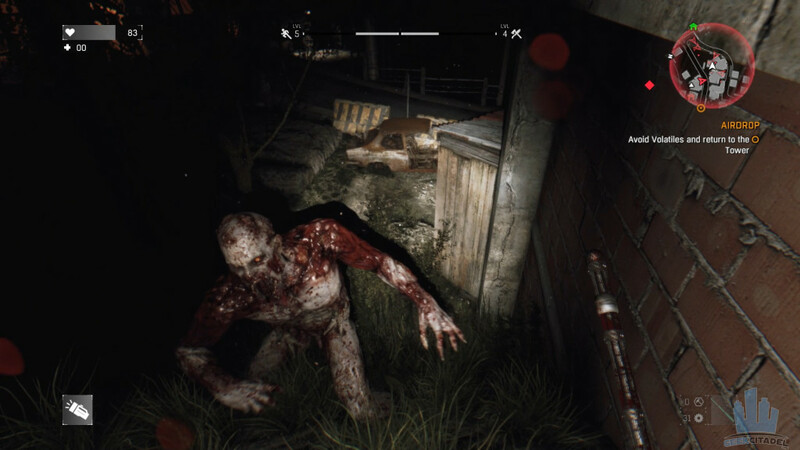 Zombie limbs crumble to the ground, explosions provide convincing particle effects, and moving through the darkness with only a small cone of light to guide you – is terrifying. Free Running – Assassin’s Creed is probably the game that most people mention when speaking of parkour movements. 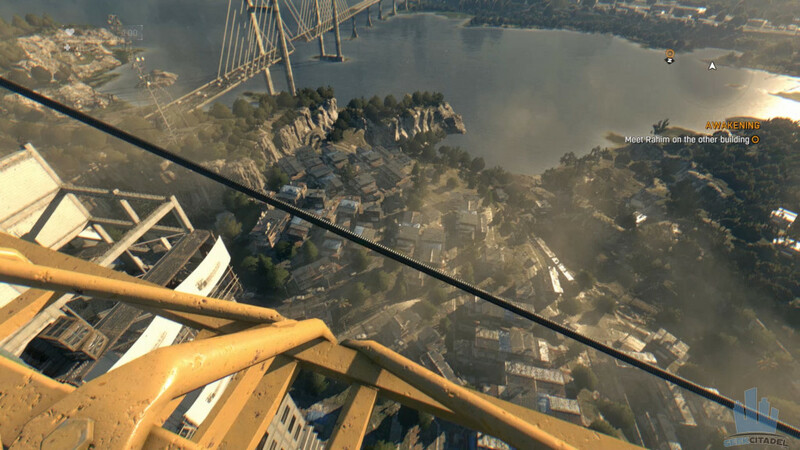 Dying Light trumps that system completely by foregoing the automation of free-running. You are in complete control of Kyle as he sprints, jumps, and latches onto the terrain to move around. It gives a sense of euphoria and control that hasn’t been done before in video games. It’s ripe with smooth transitions as you bound over zombies or claw your way to the top of a building to enjoy the view. It only gets better once the Grappling hook comes into to play, you’ll practically breeze through areas without ever losing your momentum. Techland got this one right and I’m in love with it. Skill Tree – Dying Light has a talent tree system that’s actually mechanically sound. Skill points are earned by completing missions or by attacking or free-running. There are three different trees and each levels independently of the other. A lot of skill trees in other games are about making our characters overpowered. Dying Light reveals an ability tree that improves the players skill but doesn’t make the game easier because of it. Night Terrors – When night falls an untold darkness descends upon the city, bringing out the gruesome terrors of the world. Dying Light completely drenches the city in darkness. You can barely see your surroundings or the creatures that lurk in the night. Vicious hunters lurk through the shadows sniffing out any runner who dares to step in front of them. They can chase Kyle down mercilessly and beat him to death in seconds. Playing the game at night is like turning on the hard mode. You are rewarded more ability points for running through the night, but it’s highly likely that one wrong step will summon a slew of zombies. Cooperative Play – Unlike Far Cry 4 or AC Unity, four players can leap into the world of Dying Light and take on every single mission together. I don’t have to tell you that playing cooperatively leads to endless hilarious scenarios. The transition from single-player to playing with friends is seamless, and while our play sessions had a few hiccups – it was worth suffering to play with a pal. Traveling – The map in Dying Light is huge, it’s not as gigantic as say Far Cry 4 but it does take some time to get around. That being said, there aren’t any vehicles, or options to fast-travel to any of the many safe houses in the game. I can understand this not being an option at night, but at least let us get around quickly in the day time. Running across the map for long periods of time can be a bit of a chore even after obtaining the grappling hook. Boring hero, boring story – Kyle Crane parachutes into Harran with a bad attitude. He helps people out but treats them like trash while doing so. He’s also a bad judge of character and does some questionable things for the sake of a relief organization named the GRE. He does it all so that he can find a special file which can somehow make things worse than a zombie apocalypse. The story plays it by the numbers with some cringe worth scenarios of evil villain syndrome as well. At least the people in the Tower are often normal enough to pull Dying Light back from its James Bond aspiration drawbacks. 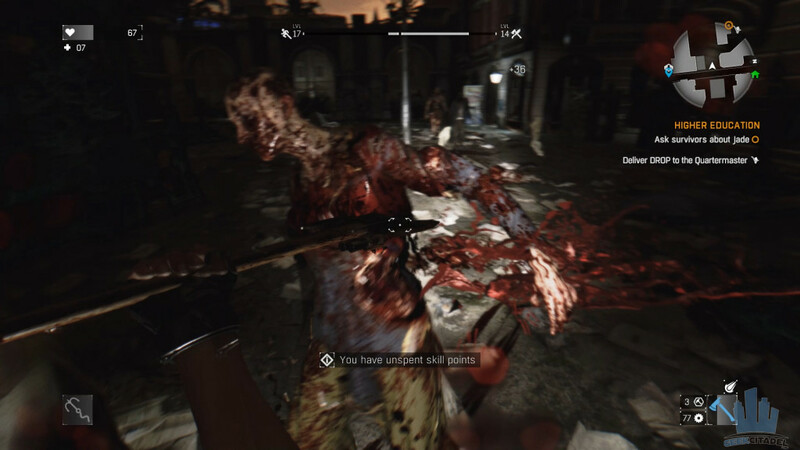 Combat system – Regular zombies take much too much damage at the beginning of the game. Using melee against intelligent enemies consists of them dodging 60% of your attacks. Not only are they clairvoyant the humans have the ability to parry your attacks, and this is a skill that the Kyle never receives. The system quickly boils down to using a back-step and power attacks to defeat enemies. It’s a real shame too, the melee system has a lot of potential for a constructive parry, block, and dodge system. I’m thinking more along the lines of games like Medieval, Zeno Clash, or even a first-person Batman system – albeit with more skill involved. Stretched out Fetch Quests – I don’t like Fetch quests but I tolerate them in most games. Dying Light has a particular formula of Fetch quests that truly wins the bad award. Go here and find this individual, now this individual will tell you to go here, now go back to that individual. Now the individual you just ran across the map to, will tell you to go to another individual, and that individual may give you a quest reward or send you to the first individual instead. This happens too much for my liking, and it wouldn’t be a problem if you didn’t have to run for five to ten minutes to get around. If a game is going to remove fast travel, don’t give me long drawn out quests for the sake of stretching out the game. Optimization on PC – I’m running a GTX 980 on an i7 4770k with 12 gigs of DDR3 ram and Dying Light consistently dips below 60 fps with all settings turned on. The main culprit seems to be the view distance setting and simply turning this down offers a much smoother session. You’ll have to mess with your settings to get 60 fps most of the time, but the frame rate still dips to below 50 FPS when viewing the city from up high. I also encountered the occasional stutter when activating one of the many dialogue cutscenes. Patch 1.2.1 made a lot of these issues less apparent, but they were still there to nag me whenever I forgot about them. There were also quite a few bug issues that were pretty hard to ignore, like my coop partner constantly crashing, or enemies appearing in safe zones that we couldn’t protect ourselves against. Dying Light is a game I didn’t expect much from, but it completely took me by surprise. As I’m writing this, I’ve played thirty or so hours and my fun level spiked the more I played. Even though we recommend you Wait for a Sale for Dying Light, it’s still a game that we think you should play. There are a lot of optimization issues plaguing the PC version at the moment, even with the updates it is hard to recommend the game at full price. The fetch quests and story bring down the pacing of the game significantly, but the freedom of movement, brutality of traveling at night makes this a game worth purchasing for zombie enthusiasts. For everyone else, It’s worth trying out if you can get it at forty dollars and below.